Screwfix has announced a successful launch of its store opening, the 4th store to open in Coventry. The store in Henley Industrial Park, officially opened its doors on March 7 2019 with hundreds of eager customers ready to stock up on the latest tools and trade essentials. On the same day, the company opened a new store in Helston Business Park, Clodgey Lane, Cornwall as well as a new store in Doulas on the Isle of Man. This is part of the company’s growing network of over 620 stores nationwide, meaning 97% of the UK population are within a 30-minute drive of a store. 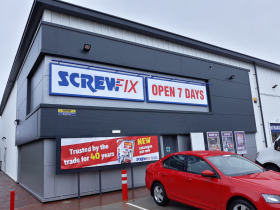 Since Screwfix opening its 600th store in September – a major milestone for the UK retailer which has added 100 new stores to its network in the past 18 months, the rapid pace of store openings has only continued, suggesting major growth in the company, with a new store opening in Flint just last month.